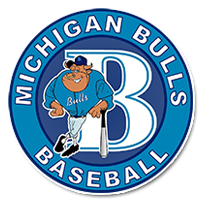 The Michigan Bulls were established in 1996 and have a long tradition of developing players of all ages to higher levels. We are focused on constantly improving the fundamental and physical side as well as the mental side of each players’ game. Off-Season workouts are at the Bullpen Baseball Academy in Novi. Players have unlimited access to the facility outside of their team practices. Our younger teams will learn fundamentals that will allow them to continue to improve as they get older. In addition to skill development we will focus heavily on game situations and playing the game the right way. Our 15U-18U program focuses on both developing/strengthening each player and assisting through the recruiting process. We have seen over 250 players receive college scholarships and 40 play professionally. In the off-season players will learn an advanced approach. There will be other tryout dates and times available for all ages. If you can’t attend please register for a private/group tryout and email seangallagher@michiganbulls.com. Please enter the text below for verification.